The John Newbery Medal has been awarded annually since 1922, under the supervision of the American Library Association, to books that are considered the most distinguished contributions to literature for children. Things are about to happen for M.C. Higgins, the Great. Mayo Cornelius Higgins sits on his gleaming, forty-foot steel pole towering over his home on Sarah’s Mountain. Stretched before him are rolling hills and shady valleys. But behind him lie the wounds of strip mining, including a mountain of rubble that may one day fall and bury his home. M.C. dreams of escape for himself and his family. And, one day atop his pole, he thinks he sees it — two strangers are making their way toward Sarah’s Mountain. One has the ability to make M.C.’s mother famous. And the other has a freedom that M.C. has never even considered. M.C. 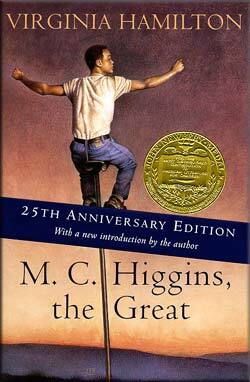 Higgins, the Great has been translated into many languages, including German and Japanese, and is regarded as one of the great works of juvenile fiction in the United States. For her novel M.C. Higgins, the Great, Ms. Hamilton was the first African American to win the John Newbery Medal. M.C. Higgins is also the only book ever to have been awarded the Newbery Medal, the Boston Globe-Horn Book Award and the National Book Award — the three most prestigious U.S. awards for children’s books.